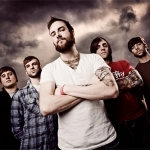 This was released as the first single from August Burns Red's Rescue & Restore. The album was made available for pre-order on iTunes on June 4, 2013 with a free download of this song. The song's interlude features a spoken word part as frontman Jake Luhrs reads a letter. The song is written from the perspective of a soldier serving overseas trying to hold on to hope. Guitarist and principal songwriter JB Brubaker explained to The Alternative Press: "The lyrics are about being stuck in a depressing time/place in your life but trying to remember there is a light at the end of the tunnel."